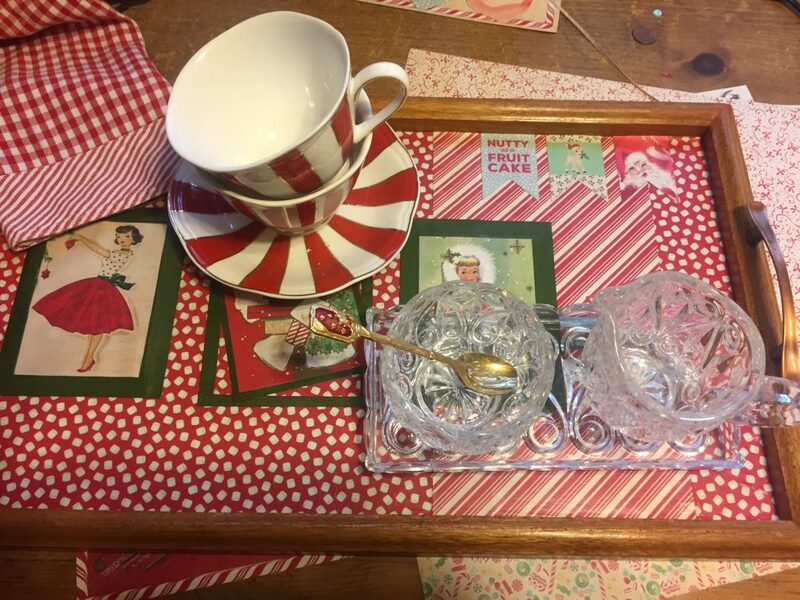 Hello my crafty friends, Lorraine here to share a little holiday tray that I upcycled using Authentique’s “Jingle” Collection. 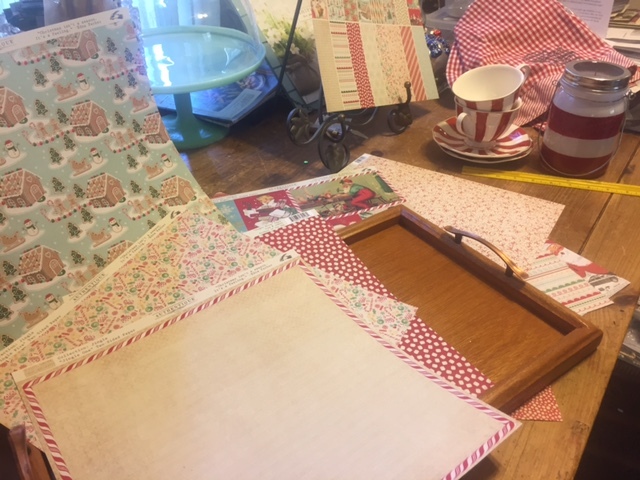 You can imagine my delight when I discovered this vintage-inspired Christmas line as part of our Latest & Greatest workshop kit. 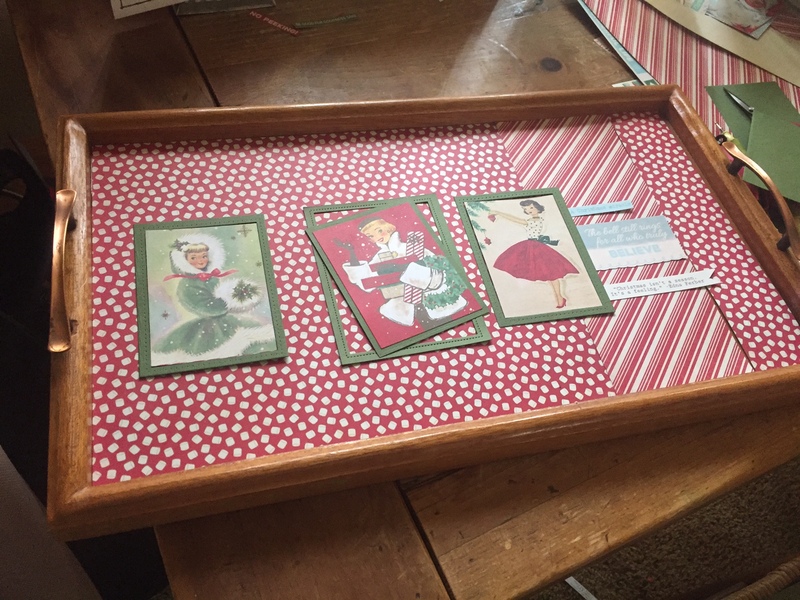 Doesn’t it work perfectly with the antique tray I rescued from my mothers-in-law’s recycle bin? I know, could you believe she was really going to throw it away? 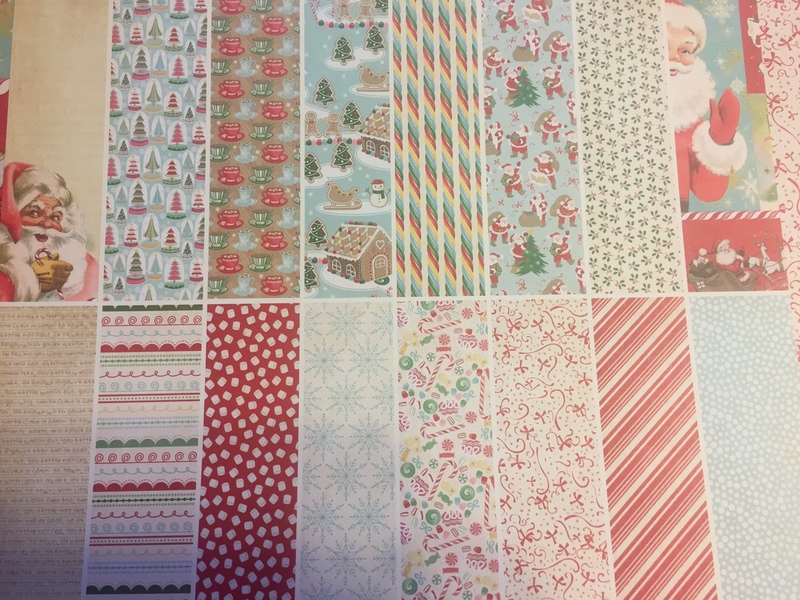 The hardest part of this project was choosing the background papers because they are all gorgeous. 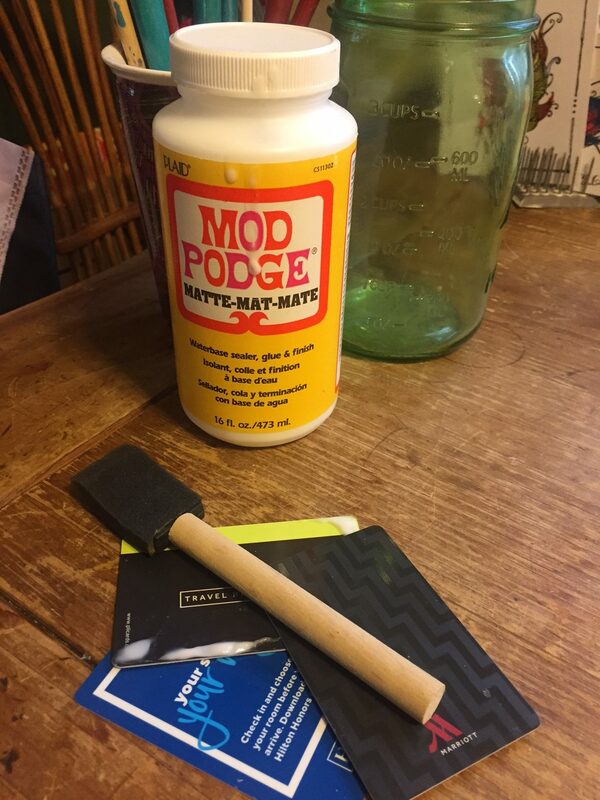 Next, I broke out the Mod Podge, one of those sponge on a stick brushes, and several old room keys. The room keys work great to smooth out any bubbles that might pop up. 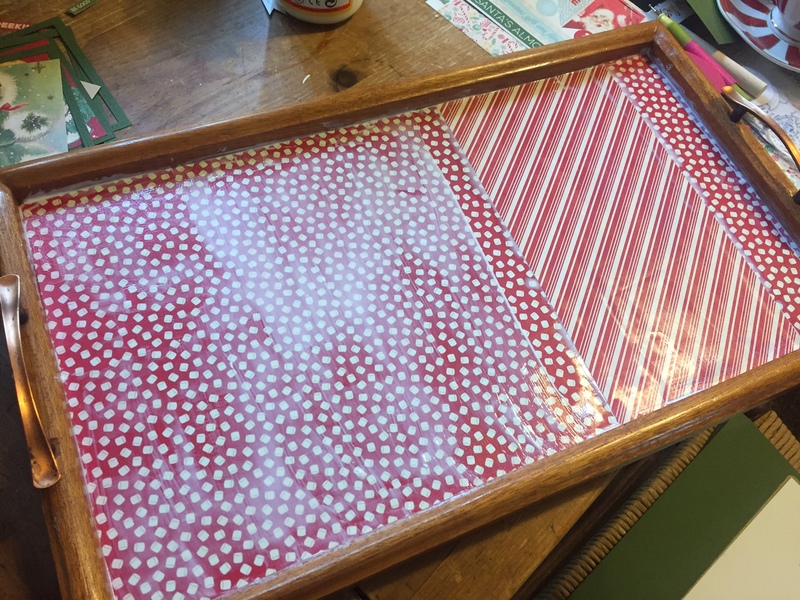 Since I was going to use the tray for snacks I went with a fun marshmallow and candy cane stripe combo for the background. 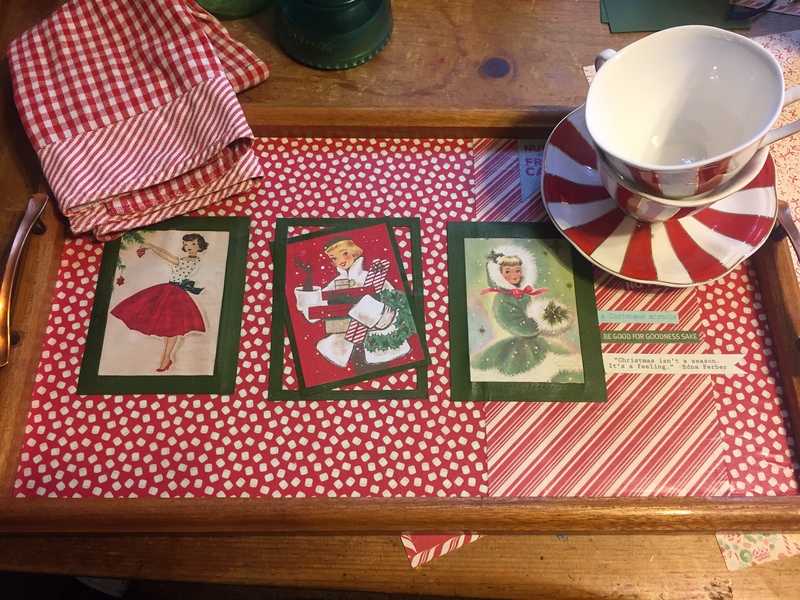 Once the paper has been trimmed down to fit the bottom of the tray, paint a thin layer of Mod Podge directly onto the tray then lay down your background papers and apply another thin layer over the top. I knew I wanted to include these sweet vintage girls as my focal point, and once the background was pretty dry I added them with another thin coat of Mod Podge. 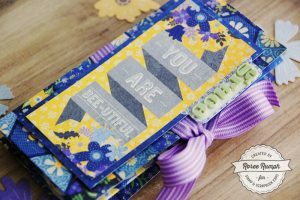 Once you have all your embellishments where you want them, add a final coat of Mod Podge. After I took the photos I decided to add a piece of glass over the top. I can already see some homemade cookies and hot chocolate ready to serve to your creative peeps. The end of our show seasons marks the beginning of my holiday crafting. I am so excited to gather all those treasures that I’ve collected throughout the show year and let the holiday crafting begin! Thanks for stopping by, I hope you have an amazing week ahead of you. This entry was posted in At Home, Blog, General Crafts, Home Decor, Inspiration Station, Latest & Greatest, Manufacturers, New Releases, Paper Crafts, Social Media, Stamp & Scrapbook Expo, Tips, Techniques & Helpful Hints and tagged Authentique Paper, DIY, Latest & Greatest Workshops, lorraine ungeheier, Stamp & Scrapbook Expo, upcycle project. I’ve made magnet boards for co-worker gifts last year using this same basic technique. Dollar store cookie sheets, scrap pieces of paper or whatever paper you have on hand, ModPodge it on the cookie sheet. Let dry and add magnets. Super quick and easy gift. Great idea Dawn, I might have to give that a try, nice to have one in my craft room. Thanks for sharing. Adorable Lorainne! Absolutely love this! Thanks, Sam glad you liked it. LOVE LOVE LOVE the tray! It is something I sould try for my gift exchanges this year and use up some paper! 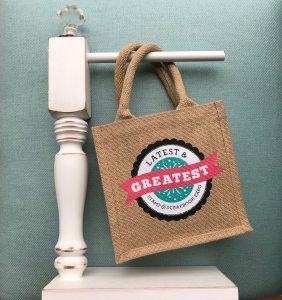 Your right, it is a great way to use up those treasured scraps & everyone loves a handmade gift. Happy holidays! Cool idea indeed. 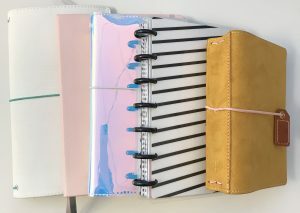 I probably would go one step further and put in pexi-glass to protect the paper. I also like the idea of using the cookie sheet to get the magnetic quality! I like the plexiglass idea, thanks for sharing.